:five hundred Al-Khalid MBT's; 320 Al-Zarrar type 85 II MBT's, 500 Al-Zarrar MBT's; 450 79II AP (Chinese type 81 upgrade, and 570 T-80 UD MBT of Ukranian make. we have T-69s not T-79s. I think we only have 300 AKs. when did we procure javelins? Indian Navy has 16 submarines; Pakistan Navy has ten, some are brand new. We do not have 10 subs. Is the writer also considering midget subs? I have respect for the author but javelin is not some secret weapon. If DSCA site has the details of how many harpoons, AMRAAMs and TOW we are going to procure then i am sure the procurement of javelins will also be mentioned. He is also wrong about some other things that i have mentioned before. I am not sure about AKs numbers but JSOW's procurement was still reported in the news (around march 2006 in dawn and pak observer). Javelin is not some super duper weapon that it would be hidden from the media. I have not yet gone through the full article, but another stregth the P.A has is it's Artillery ... comapre what we have with India and you'll see Pakistan has far more advanced artillery comapred to anything that India has of soviet era in it's inventory. Now compare this yourself to the Indian artillery which is mainly made of up Soviet era and they lack any 155 mm artillery, this is where Pakistan has an advantage over them, sure they have more numbers, but our combained numbers of 155 mm and 203 mm can produce the same ammount of fire power that the whole of Indian artillery units combined can produce. Another advantage of Pakistan is the movement of troops to the battlefiled. Pakistan has thosuands upon thosuands of APC/ Armoured fighting vehicles, India lacks such a capability of moving troops into the war zone under heavy fire. So you can see India is no where near as capable as Pakistan in terms of moving it's soldier to the war zone while protecting them from heavy fire. IIRC We use them in UN missions. Plus A-100 MLRS is on order. SH-1 is also on order. JSOW's procurement was still reported in the news (around march 2006 in dawn and pak observer). Javelin is not some super duper weapon that it would be hidden from the media. I never said that they won't be used if needed but we have thousands of troops deployed on UN missions. Bringing the equipment back will take time. There will be TOT for A-100s later trust me but it will take some years. May be may be not. I still doubt the accuracy of some things in the article.It looks like the figures were straight from wiki. His other articles are quite good. 50/yr in normal conditions.100/yr in full capacity. India may be madly purchasing the T-90s but we still have 300+ T-80 UDs and its time we develop AK2. Remember an offensive force should have 3 times the number that the defensive force has.Right now we are not going to have any war. Besides we also have thousands of new TOWs and thousands of bakter shikens. Our strategy is offensive defensive. We are not going to capture the whole cities just 15-25 kms of their area(from our border) to be used as a bargaining chip later in the negotiations or for some other purposes. But it was still reported in the media (JSOW was mentioned in the corp commander conference i guess). The writer's previous articles were way better.I still stand by my views.I am not the only one saying this.There are other threads related to this article. BRO YOU GOT EVERY RIGHT to stand by your view. T-79 II AP are called T-69 in Pakistan Army and has 105mm L/7 British gun also.The numbers of T-80UD.AK and AZ are conflicting. Interesting I never knew the PA operated the javelin? What is about the T-85IIM AP ? which we produce under licens ? I think from this Pakistan have ca. 700( 350 were buy from China and the rest were produced under licens). Second I have never see a single Al-Fahd Infantry fighting vehicle ( Saudia could give us some more for free this arabs have enough), who can prove or show me a picture that we have it ? Surely the number of AK would more than 300 ! they dont really need to report every thing. I have never doubted the capabilities of Pak armed forces to defend us from external aggression - especially from our eastern border. But the real question is who is going to save us from ourselves? Those causing trouble in FATA, Swat etc. may or may not be working for foriegn interests - I don't know, but we cannot doubt that the vast majority of the them r Pakistanis and from within our borders. We need ways of dealing with these misguided people. That is the biggest military and political problem facing the country. FGM 148 a.k.a is Javelin Missile, so we have these in our inventory? 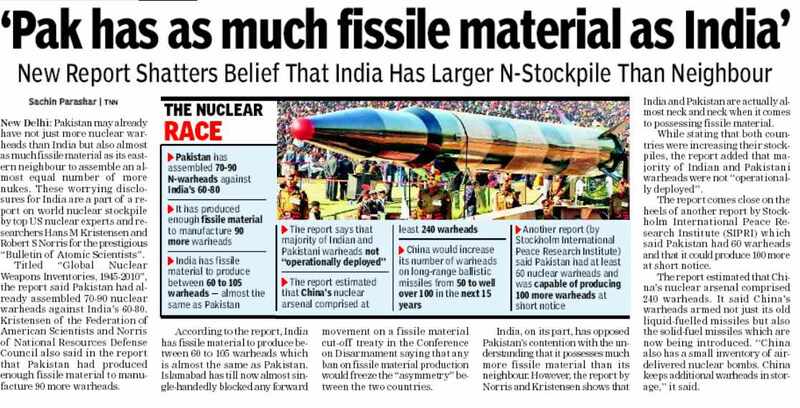 Reason why I have asked this question is the Indians have bought these Javelin Missile/buying these missiles. I think slowly comparison will become immaterial once both achieve MAD status but practically both countries can not think of war now.